Proposals are now being accepted for Therap’s 2013 National Conference for Therap users to be held in Ramada, East Hanover, New Jersey from January 29–31, 2013. Due to a clash of dates with a Nebraska providers conference, we will be moving the Therap Nebraska Conference to November 6th and 7th. All the other details remain the same, we’ll be updating the registration page soon. Today Jordan, Jeff, Sazzad, and I were in Scottsbluff, Nebraska doing some initial training on the new Individual Budgeting and ISP applications. There are definitely some very exciting times coming out here, particularly in the Western end of the state where folks will be piloting these new features. 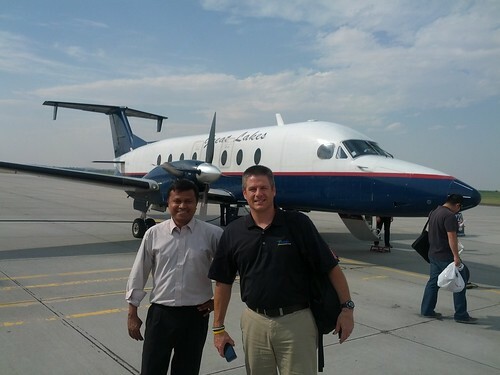 Thanks to a very small plane, Sazzad and I are off to Nebraska while Jeff heads back to KC and Jordan to Lincoln.